The principal broadcaster for the Olympics in Australia will be Channel 7, (Prime TV in regional areas). This time around we will be getting it in HDTV (1080i) in addition to SDTV. There is an interesting problem with the live broadcast of HD sports to an international audience: do you capture the image at 50 or 60 hertz? Naturally, we in Australia would prefer 50 hertz. That makes for a nice clean signal that will produce the highest picture quality that Australian TV is capable of. Americans would prefer 60 hertz, because then it feeds straight into their equipment without any frame rate conversion. The Olympics is coming from China. China is a PAL country: that is, its internal TV network uses PAL, which is a 50 hertz system. The good news is that initial word from Channel 7 is that the TV cameras will be operating at 50 hertz, so we ought to get the best possible picture quality. More as it comes through. Earlier today I emailed Audio Products Group, the Australian distributor for Denon, along with other brands, about whether it would soon be releasing the Denon DVD2500T. Despite the name, this is actually a Blu-ray player. In truth, Denon call it a 'Blu-ray Disc Transport'. This became apparent when I looked at the brochure they emailed me and inspected the picture of its back. There on the back was an RS-232C serial port, an IR in and an IR out socket, and a HDMI socket. That's it. No component video outputs. No S-Video, analogue audio or even digital audio. This unit delivers the contents of a disc (CD, DVD Video, Blu-ray and various computer formats) digitally, and that's all there is to it. Is this the way that Blu-ray players will go? I suspect that it's likely. I think that in the end all the outputs other than HDMI will be shed. However, some more internal processing will be required. In particular, it will necessary for a full set of audio decoders to be included -- ones capable of decoding two streams at once -- two support the highest quality primary/secondary audio output. This unit offers bitstream output but, as I understand it, no internal decoding. APG expects the Denon DVD2500BT to be available in Australia in September, selling for around $1,899. It is a full Final Standard Profile unit and uses SD as its storage medium. The pricing reflects the premium nature of the product, which weighs a massive 9.2 kilograms. I have previously whinged about region coding on Blu-ray. If you are considering purchasing a Blu-ray disc from overseas, particularly from the US, go first to the Blu-ray Region Code Info page and make sure that your contemplated purchase is in one of the green coloured 'Region Free' lines. If the movie is distributed by Warner Bros, you're likely to be in luck. I have just inspected this page and all the dozens of Warner Bros titles are region free. Brilliant, Warner Bros! I love you not only for your fine movies, but for providing wide access to them. The only other label for which I've been able to find similar results has been Paramount. But I'm not certain Paramount is really back into the Blu-ray swing of things, having abandoned Blu-ray for HD DVD last year (it, like Warner Bros, started off releasing movies on both formats). The Paramount Blu-ray titles available on Amazon seem to have been around for a while, and at least one -- 'Shooter' -- is selling in Blu-ray format from a minimum of $US57.95, suggesting that it is no longer available from the source, and remaining supplies are being bid up. It's interesting that the two companies that launched into Blu-ray and HD DVD agnostically are not (so far) using region codes on Blu-ray (HD DVD doesn't support region coding). When Universal (which was HD DVD-only from the start) finally starts releasing Blu-ray discs, perhaps it also will be region free. Also on Blu-ray Region Code Info, I notice that it lists the recent 'No Country for Old Men' from Miramax as region free, while several older Miramax titles are region coded. Could it be that this studio, at least, is moving away from them? There may continue to be a need for region coding, such as when the international distribution rights to a movie are held by a different company to that with US distribution rights. But I do wonder why companies such as Twentieth Century Fox and Sony and Disney/Buena Vista needlessly complicate their inventories. I've just noticed that Fox has applied region coding to 'Wall Street', which was made way back in 1987 for goodness sakes. Worse yet? Image Entertainment has released in the US a Blu-ray version of 'Breaker Morant', a 1980 Australian film. But it is region A coded, so it can't be played on Australian Blu-ray players. Thank goodness 'The Searchers' and 'Casablanca' and the like were made by Warner Bros.
Last night I watched, with one of my daughters, the 1922 version of Nosferatu. The picture quality wasn't particularly good, yet it was still strangely powerful at certain points. My daughter, who has read Bram Stoker's novel Dracula, of which this movie is an unauthorised adaptation, was helpful in clarifying which elements of the story had been changed. This morning I discovered that Kino has released a restored version. If it is anywhere near as good as the Kino restoration of Metropolis, it should be brilliant. In Australia a similar restored version is due for release on 21 May this year by Madman. Anyway, watching Nosferatu inevitably led us to watch the 1931 Tod Browning version of Dracula. This was initially a bit tricky because the character who travelled to Transylvania to meet Dracula was not Jonathan Harker, as it is in the novel and in the 1992 movie version, but the Renfield character. This Renfield acts as Dracula's assistant later, and is clearly mentally disturbed. In the 1931 version of the movie, having him meet Dracula is the trigger for him becoming that way, so it's actually a fairly clever change to the story. When I first got into hifi in the early 1970s, one of the musical groups to which I formed a close attachment was Alice Cooper (yes, back when it was both a person and a group). One of my favourite albums from the group was 'Love it to Death'. One of my favourite songs from the album was 'The Ballad of Dwight Fry'. It is still a song I listen to from time to time, thirty five years later. But until last night it had never occurred to me that the Dwight Fry of the song was ever anything other than an invented name. The song is from Fry's point of view and is a, er, contemplation of his precarious mental condition. But just as Dracula was starting, up flashes the name 'Dwight Frye' as one of the actors. 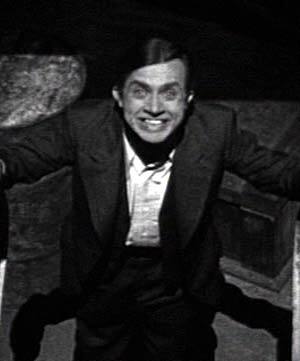 It turns out that he plays the insane Renfield (pictured). He, apparently, was the inspiration for the Alice Cooper song made four decades later, even though they managed to spell it incorrectly. Last night I received a telephone call from a reader who wanted to know if Australia would be switching over to MPEG4 for its digital TV broadcasts. At the moment we are using MPEG2, the same codec used for DVD. The reason he was wondering was because one store was touting the ability of certain digital TV products that it sells to decode MPEG4-encoded digital TV broadcasts. It struck me as unlikely that Australian DTV would switch over to MPEG4 since this would render a sizable proportion -- in fact, the overwhelming majority -- of current digital TV equipment obsolete and, therefore, useless. Neither the Australian government nor the TV broadcasters would have much of an interest in that. I am using MPEG4 to mean Part 10 of the MPEG4 specification, which provides for the 'Advanced Video Coding' codec (AVC), also known as H.264. There are other codecs available under the broad MPEG4 specification. What MPEG4 has going for it is higher compression efficiency. However this will not yield enormous bandwidth savings compared to MPEG2. It could provide slightly improved quality for similar bandwidth. But I doubt that any stakeholders would consider this sufficient benefit to justify the problems it would cause. To confirm this, earlier today I spoke to Tim O'Keefe from the Australian Digital Suppliers Industry Forum (ADSIF). His body is aware of no moves at all on this front, not the slightest suggestion. So, should you look for MPEG4 AVC decoding ability in your digital TV receiver? If it is network capable, then yes. It might come in useful for displaying Internet-sourced material. But for simple TV viewing, whether in standard or high definition, there is no need or advantage in having this capability available, unless you are planning to move to Europe and taking your TV or whatever with you. Europe may indeed be introducing MPEG4-based digital TV.